We now have a piece mentioning the Smart Choices program in The Economist as well as a letter from Dr. Eileen Kennedy, the member of the Smart Choices program committee to whom the quotation about Froot Loops, “Better than a doughnut,” is attributed. The Economist discusses the booming business of functional foods: “Consumers are swallowing such products, and the marketing claims that come with them.” It mentions the fuss over Smart Choices, but the best part is the caption to the illustration that comes with it. There is an issue that has emerged as a result of a NY Times article that appeared in the business section on Sept 5, 2009. Since I believe I was grossly misquoted in the article and that the article does not accurately depict the Smart Choices program, I want to share with you some background on this program and my involvement. In 2007, I was invited to join the Keystone Roundtable on Food and Nutrition. Keystone is a non-profit organization that brings individuals together around potentially controversial issues. The roundtable included health organizations, food companies, retailers, and academic researchers from a variety of U.S. universities. I was one of the academics who served pro bono on the roundtable. Initially, we met to discuss revisions to the FDA nutrition label. Ultimately, we decided to address the issue of Front of Pack Labels on food products. The final recommendations of the group were based on consensus science including the Dietary Guidelines for Americans, the FDA definition of healthy, WHO recommendations and the Institute of Medicine Scientific reports. The program that emerged from this meticulous process is called “The Smart Choices Program (SCP).” Food products that qualify as “better for you” get a check mark as well as disclosure of calories per serving and number of servings in a product. I believe there are three major advantages to this program in addition to the rigorous scientific underpinnings. First, the SCP is intended to improve food patterns at point of purchase – the super markets. To do this, food products are divided into 19 categories – based on research – that reflect how people buy food. All fruits and vegetables without additives automatically qualify. Second – and a major plus – the program was tested prior to launch with consumers. Finally, food companies who participate in the program have agreed to abandon their proprietary systems and adopt one system – the Smart Choices Program. Thus, thousands of products using the SCP check mark will reach millions of consumers. It is a credit to the social responsibility of participating companies that because of the strict nutrition criteria, fewer of the individual food products will qualify for the Smart Choices Program. As a non-industry board member, I have been targeted by negative emails, letters and even some phone calls. I regret that some of this hostility has been focused on the Friedman School and Tufts University and must note that I serve as an individual on the Smart Choices Program. Tufts University is not involved with it…. As nutritionists, we know that, in many ways, the science of nutrition is straight-forward. It is the translation of science into action that is often complex and can be contentious. Within our field, there are many opinions on how to improve the nutritional well-being of people worldwide. It is precisely at an academic institution like Tufts that we should have a respectful and open dialogue about these issues….For additional information, you may also want to go to www.smartchoicesprogram.com…. The letter gives me a chance to repeat a few points that I have made in previous posts (see Smart Choices, Scoring Systems) and on the general matter of corporate sponsorship of nutrition activities (tagged as Sponsorship). First, this enterprise was paid for by participating companies to the tune of $50,000 each for a total of $1.67 million. Social responsibility? I don’t think so. Companies usually get what they pay for. Hence: Froot Loops. Second, a comment on the research basis. 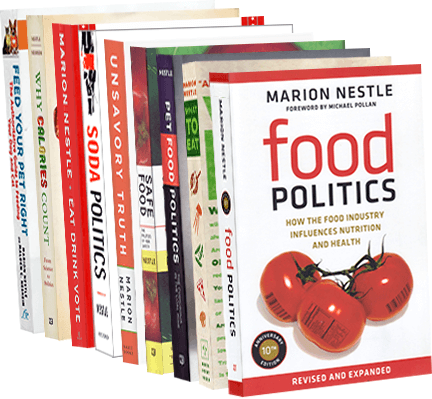 I have written extensively in Food Politics and in What to Eat about the influence of food companies on federal dietary guidelines and the compromises that result. Even at its best, the process has to be impressionistic and cannot be either meticulous or rigorous. The guidelines are meant to be generic advice for healthful eating. They were never meant to be used – and cannot be used – as criteria for ranking processed foods as healthful. The FDA standards for comparison to Daily Values on food labels are also worth a comment. They were the basis of Hannaford supermarkets’ Guiding Stars program, which awards one, two, or three stars to foods that meet FDA-based criteria. By those criteria, Froot Loops does not qualify for even one star. If Smart Choices had relied on FDA criteria, such products would not be check marked. Dr. Kennedy makes some excellent points in her letter and I particularly agree with one of them: nutritionists differ in opinion about how best to advise the public about diet and health. Mine is that the Smart Choices program is a travesty and the sooner it disappears, the better. Thanks to blogger Hemi Weingarten for telling me about the new scheme from Stop and Shop to help you pick out the thousands of foods it identifies as better for you. As you know from my previous postings on these schemes (filed under Scoring Systems), I don’t have much love for food rating systems. They depend entirely on who devises them. It is very much in the interest of Stop and Shop, PepsiCo, Kraft, Unilever, and all the other companies that are doing this to devise criteria that allow lots of their products to qualify. Recall the Hannaford example: when the supermarket chain recruited independent nutrition experts to devise criteria, less than one-fourth of the products in the stores qualified even for a one-star rating and most of those were fruits and vegetables in the produce section. The moral: eat minimally processed foods and you don’t have to worry about such things. Adam Drewnowski at University of Washington in Seattle has come up with yet another scoring system to rank the nutritional value of food products. So we now have three done by independent scientists: Hannaford’s, David Katz’s, and now this one (see previous posts). And companies like Kraft (Sensible Solutions) and PepsiCo (Smart Spot) have their own. What is a consumer to do? I, of course, say get rid of all of them. I’m willing to concede that an alternative would be for the FDA to convene a summit and select one rating method. As these systems proliferate, the “one rating system” idea looks better and better, no? Dear irritable, fretful: Me too. I’m not much for scoring systems of any kind on food. I don’t think you need a score to know whether you are eating a junk food or not and is a slightly better junk food better for you? I can’t remember who started these things but PepsiCo has its Smart Spots and Kraft has its Sensible Solutions and companies like those can set up their own criteria for what is and is not “healthier.” It’s a lot of fun to go to supermarkets and look to see which products qualify. Kraft’s Lunchables are a good place to start. See if you can tell the difference between products that do and do not qualify. Hannaford supermarkets got some independent nutrition researchers to develop criteria for awarding one , two, or three stars to healthier products and guess what: less than one quarter of nearly 30,000 products qualified for even one star, and most of those were fruits and vegetables in the produce section. So when the criteria are tough, hardly anything qualifies. So now Dr. David Katz at Yale has gotten a committee together to develop his own set. You have to have a degree in mathematics to understand it but that doesn’t really matter. Do you really need a scoring system to tell you that General Mills’ Wheaties (score: 246.2403) is better than Barbara’s Puffins Peanut Butter (9.937892) or Kellogg’s Cocoa Krispies (0.476746)? Never mind the apparent but misleading precision of the 4 to 6 decimal places. All of these are low scores. The problem with these systems is that the criteria are arbitrary and make some highly processed foods look better than others. This is a great marketing tool but will it help people eat more healthfully? I doubt it. I take an extreme position on all such systems. They should not be allowed. If we must have them, the FDA needs to step in and set up one set of criteria. And I don’t envy the committee that has to do that. So I am adding one more item to my list of “rules” for supermarket shopping in What to Eat. If it has a self-endorsement of nutritional quality, don’t buy it; such things are about marketing, not health. Hannaford, the supermarket chain in the Northeast, today reports the one-year results of its Guiding Stars program. This, you may recall, puts zero, one, two, or three stars on foods in the store, depending on how the products meet some rather rigorous nutrition standards. When the program started a year ago, less than one-fourth of 27,000 foods in the store qualified for even one star (when the criteria are independent, products endorsed as healthy by their makers do not qualify). Did the program encourage people to choose products with stars over those without them? It did! Take a look at the results and see if you think this approach is worthwhile. Hannaford does not reveal its nutritional criteria for awarding stars because of patent issues. I think it should. If the program works, other stores might be encouraged to try something similar. And here’s what the New York Times has to say about it.